OhMyVera! A blog about all things Vera Bradley: Vera Bradley Sale Time! Today Vera Bradley put the following colors on sale: Plum Crazy, Jazzy Blooms, Ribbons and Canterberry Cobalt. 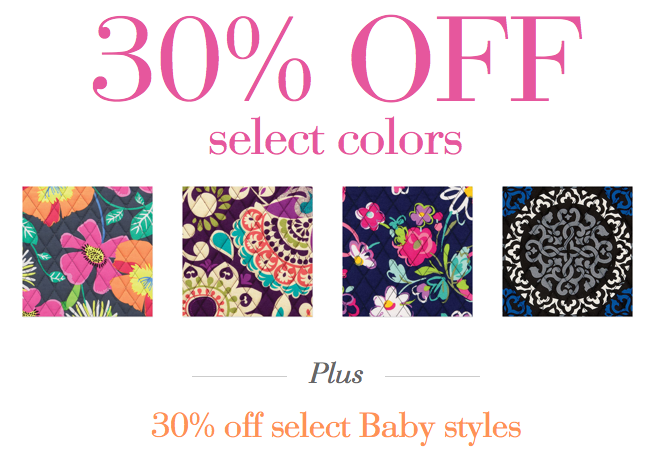 These colors are currently 30% off. Along with some baby stuff! Jazzy Blooms and Plum Crazy are two of my favorites! I love Jazzy Blooms too! Need to take another look at Plum Crazy ... I always say, some prints don't grab you from the screen but you see them in person and WOWZA :-) *** Any idea if they're continuing with the birthday program this year? Mine is in October ... Planning and dreaming already! Do you think that these patterns will be discounted even more than 30% in the next few weeks? Particularly, Plum Crazy.